There are eight subspecies of moose recognized, and the Alaska-Yukon race (Alces alces gigas) is the largest. Moose are an important source of food for Alaskans, and at least 7,000 moose are harvested annually in Alaska, amounting to about 3.5 million pounds of meat. 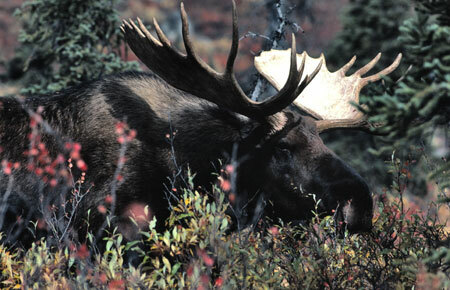 Moose are valued for their meat and as a game animal. At least 7,000 moose are harvested annually in Alaska, amounting to about 3.5 million pounds of meat. In 2007, Alaskans took home 90 percent of the 7,400 total moose harvested. About 6,750 moose were harvested by Alaskans and 685 by nonresident hunters. The resident take is certainly higher than this, based on information collected by the Division of Subsistence, and considerable unreported or illegal harvest likely occurs in some areas. 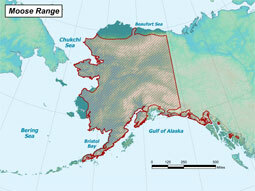 Wildlife viewing is becoming increasingly important in Alaska. In a questionnaire completed by users of the Koyukuk Controlled Use Area, moose is the species people want to see the most. While the majority of respondents reported they were hunting only, an increasing number of people were both hunting and viewing, or only viewing. Moose viewing is particularly important along the road system. A number of moose research projects are being conducted in Alaska, looking at nutritional needs, habitat use, and predator-prey relationships. Alaska has been a leader in moose research. The Kenai Moose Research Center has captive moose and over the past three decades, hundreds of moose research projects have been conducted there. See Alaska's Kenai Moose Research Center, a World Leader in Moose Science.